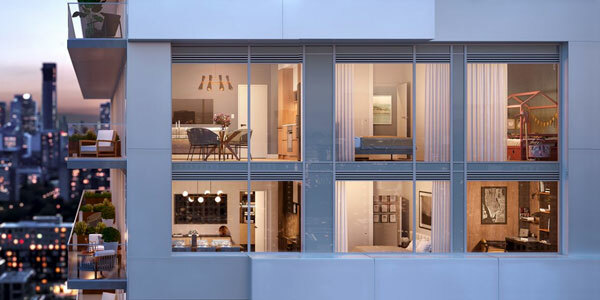 River & Fifth Condos by Broccolini Developments is where nature and the city meet. Located along the west side of the Don Valley River, nestled between Dundas and Queen Street East will soon be home to a 38-storey condo residence. 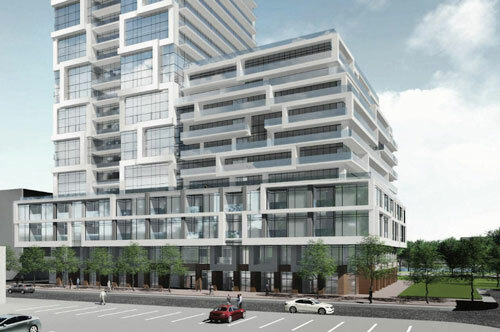 On the corner of Defries Street and Labatt Avenue will be 12 2-storey townhomes in the condo’s 4-storey base podium. Set back from the podium will be a 11-storey mid-rise volume which will house, in part, the interior amenities. The 12th floor will include both indoor and outdoor amenities and serve as the base of the tower which will contain the majority of the 560 condo units. River & Fifth Condos is close to so many of Toronto’s best neighbourhoods. Shop the many boutique stores and restaurants in Leslieville, take in glorious city views from Riverdale Park or visit the animals at Riverdale Farm. A short stroll will take residents here to charming St. Lawrence Market or even the historic Distillery District. Reach the downtown core in minutes via the Dundas, Queen or King Streetcars, all of which are just around the corner. Not to mention your extremely close proximity to the DVP and Gardiner Expressway. River & Fifth Condos has all of the convenience of the city tucked away amidst nature trails, parks and more.